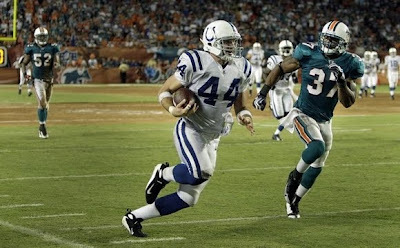 MIAMI -- The few plays that the Indianapolis Colts had the football on an unusual Monday night, it usually ended up in the trusty hands of tight end Dallas Clark. And that was just enough, despite only 14 minutes and 53 seconds of possession time, to squeak out a 27-23 Colts victory over Miami at Land Shark Stadium. On the game's opening play, Clark started the "Monday Night Football" party with an 80-yard touchdown reception. In the fourth quarter, he set up quick Colts touchdown drives with key catches, the first for 49 yards and the latter for 17 yards. By game's end, Clark had a team-record 183 yards on seven catches, which ranked as the fourth-highest yards total in a game for a tight end in the NFL since 1970. Denver's Shannon Sharpe had 214 in 2002, the New York Jets' Rich Caster had 204 yards in 1972 and Cleveland's Ozzie Newsome gained 191 yards in 1984. The Dolphins learned on the first play covering Clark with a linebacker is asking for trouble. He ran past Akin Ayodele, caught the play-action pass down the middle of the field, broke a tackle from safety Gibril Wilson and had nothing but open field. The Colts were ahead 7-0 in just 12 seconds. "Hopefully everyone had their drinks and chips and were sitting down and didn't miss that one," Clark said. "Good thing I stretched, so I didn't pull a hammy on that one. "It was a good way to start. We needed it. That's the way you need to start on the road, especially in an environment like this, it's just a great football environment. It was a good way to open." The quick score was also the start of a trend for the evening. The Colts put up points quickly. The defense couldn't get off the field and gave the points up slowly. That meant fewer plays. The Colts had the ball for just three plays in the third quarter. By the end, the Colts ran 35 plays to the Dolphins' 84. But Clark still came up clutch. Down 20-13 early in the fourth, Clark almost scored on another big play as he took a second-and-7 pass from Peyton Manning and gained 49 yards to the Colts 24. "I know, if I just had some more blockers downfield," Clark said of possibly scoring on another long one. "Ah, I'm just joking. It was close." The Colts tied it four plays later on Donald Brown's 15-yard run up the middle. The Dolphins responded with another long drive, this time 10 plays that ate up 6:16, and took a 23-20 lead. But back came the Colts. The key Clark catch this time was a 17-yarder to the Dolphins 48. Two plays later, Manning hit Pierre Garcon on a bubble screen pass that the second-year native of West Palm Beach, Fla., broke for the 48-yard touchdown that was the game's final score. "It was fun," Clark said. "We did what we had to do. "Great call and a great audible to get that screen to Garcon. Everyone did their assignments and made their blocks and you're not catching him. He was probably the fastest guy on the field."